When the Frederick Cooper Lamp Factory at 2545 W. Diversey Ave. sent its jobs overseas, it left hundreds of workers unemployed and a large, empty – but historically significant – building in Logan Square. Well aware of the numerous industrial buildings that had been converted to condominiums, Logan Square Neighborhood Association (LSNA), the LEED Council and local elected officials created the Cooper Lamps Task Force to find an owner for the building who would provide new economic vitality and needed jobs in the area. The community found its partner in Baum Development. The firm imagined a “green incubator” – a new type of multi-tenant building that could attract companies and employ more than a thousand local workers. 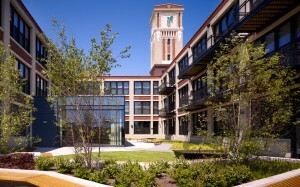 Baum aimed to create a new hub for “green collar” jobs in Chicago. The Task Force’s vision has been realized in the Green Exchange. The 270,000-square-foot building is now the largest sustainable business site in the United States. It offers each of its 30 tenants spacious offices and common spaces where like-minded people can gather and share ideas. The building also has an organic sky garden, a restaurant, expansive meeting and event space, on-site catering services, and parking. The Green Exchange is the workplace of more than 1,200 employees. Existing restaurants, gas stations and shops surrounding the site have seen an increase in foot traffic and new businesses have begun to sprout up, creating more ancillary jobs and invigorating the neighborhood. For creating an economically and environmentally sustainable development model in Logan Square that meets the community’s needs, Baum Development is the winner of this year’s Outstanding For-Profit Neighborhood Real Estate Project.